A striking looking bass with a great sound, even with the most basic fixtures and fittings. The temptation to go over budget. Think Carvin, think custom order at a wallet-friendly price. Like most of its instruments, the SB4000 featured here comes with a bewildering number of options that include a choice of woods, finishes, electronics, inlays, fretted or fretless and even the headstock logo! But in its basic guise it's an original design, with an offset body and splayed cutaways. The price quoted is for the standard instrument, and each change of wood, finish or electronics carries a surcharge. Extras include a pearloid scratchplate, pearloid tops on the controls and abalone dots on the maple fingerboard. The robust, chunky bridge offers through-body or surface stringing, it's multi-adjustable and can be locked into position, always a bonus on basses. "The SB4000 produces a robust and solid sound with plenty of thump and projection"
Our example has two Carvin J99A Alnico single coils, which give the expected range of mixed-pickup, jazz-like sounds. The through-body stringing offers extra warmth, and the SB4000 produces a robust and solid sound with plenty of thump and projection. Blending the pickups produces some truly succulent hollow tones, particularly when backing off the extremes of the volume controls. If you do go for flat-out then the growl factor kicks in. 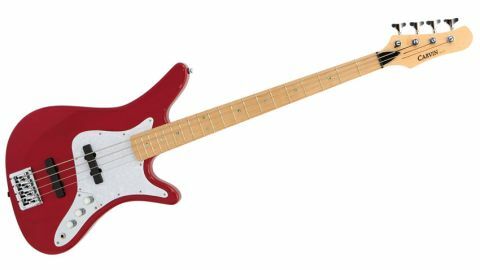 It's a very good passive bass and, given the choices available, you can easily create your own 'signature' USA-made instruments at an off-the-shelf price.